The School Curriculum and Standards Authority is responsible for curriculum, policy advice and guidelines for all Western Australian schools from Kindergarten to Year 12. The Kindergarten Curriculum Guidelines reinforce the themes of the Authority's Kindergarten and Pre-primary Statement for Western Australia and the Guiding Principles for Western Australian schools outlined in the Western Australian Curriculum and Assessment Outline. The Kindergarten Curriculum Guidelines guide educators to develop kindergarten curriculum for Western Australian children. The guidelines draw from the key ideas and related content from the EYLF to construct curriculum to ensure that all children in Kindergarten experience quality teaching and learning. Kindergarten children are connected to family, community, culture and place. Their learning takes place through these relationships. As children participate in everyday life, they develop interests and construct their own identities and understandings of the world. 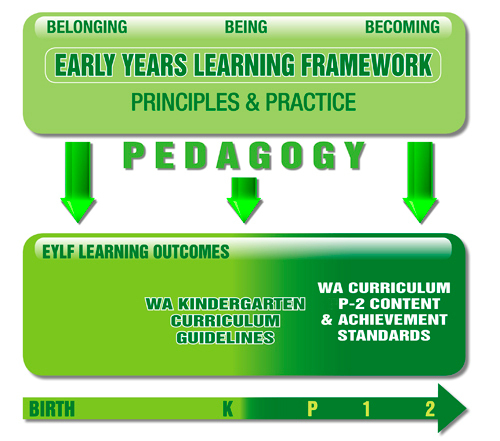 The following figure illustrates how the EYLF establishes the foundations for effective learning from birth through to age five and beyond.